ORTELIUS -Russiae, Moscoviae et Tartariae Descriptio. ORTELIUS, A. - Russiae, Moscoviae et Tartariae Descriptio. Russiae, Moscoviae et Tartariae Descriptio. - ORTELIUS, A. 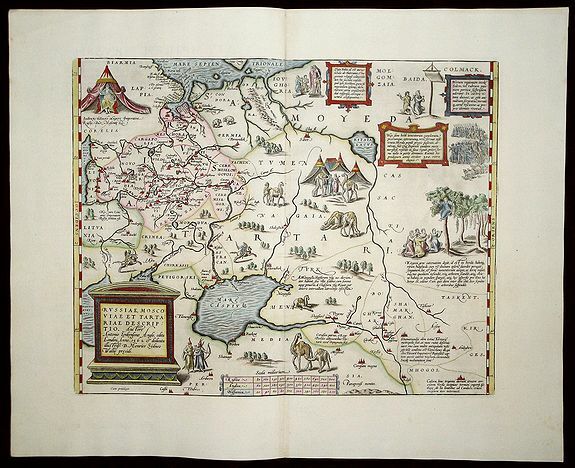 Title : Russiae, Moscoviae et Tartariae Descriptio.. Size : 13.9 x 17.5 inches. / 35.4 x 44.5 cm. Description :Engraved by Frans Hogenberg from an original of 1562 by Anthony Jenkinson of the English Muscovy Company. The many vignettes are based on the reports of Marco Polo's explorations.